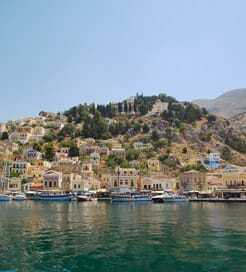 There is no shortage of options to choose from when it comes to selecting a ferry from Greece to Dodecanese Islands. There are 6 ferry companies with a combined offering of 271 Ferry Routes connecting Katapola (Amorgos) to Kos, Karpathos to Rhodes, Kasos, Kalymnos, Kos, Leros, Lipsi, Patmos, Symi (Simi), Chalki & Diafani, Katapola (Amorgos) to Kos, Rhodes, Leros & Patmos, Piraeus to Astypalea, Rhodes, Tilos, Karpathos, Kalymnos, Kastelorizo, Kos, Leros, Nisyros, Patmos, Lipsi, Symi (Simi), Chalki, Diafani & Kasos, Kalymnos to Kastelorizo, Kos, Leros, Nisyros, Patmos, Rhodes, Tilos, Symi (Simi), Lipsi, Astypalea, Karpathos, Kasos, Chalki, Agathonisi & Arki, Kastelorizo to Kos, Nisyros, Rhodes, Tilos, Kalymnos, Symi (Simi), Astypalea, Patmos & Lipsi, Kalymnos to Kastelorizo, Kos, Leros, Nisyros, Patmos, Rhodes, Tilos, Symi (Simi), Lipsi, Astypalea, Karpathos, Kasos, Chalki, Agathonisi & Arki, Katapola (Amorgos) to Kos, Rhodes, Leros & Patmos, Kos to Leros, Nisyros, Patmos, Rhodes, Tilos, Kalymnos, Kastelorizo, Symi (Simi), Lipsi, Astypalea, Karpathos, Kasos, Chalki, Agathonisi & Arki, Paros to Leros, Rhodes, Tilos, Kalymnos, Kastelorizo, Kos, Nisyros & Astypalea & Kalymnos to Kastelorizo, Kos, Leros, Nisyros, Patmos, Rhodes, Tilos, Symi (Simi), Lipsi, Astypalea, Karpathos, Kasos, Chalki, Agathonisi & Arki. 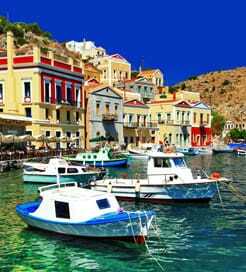 The fastest route between Greece and Dodecanese Islands is Lipsi to Leros with a crossing duration of around 20 minutes. With so many routes on offer we make it simple by comparing all similar routes in one search so you can quickly find what you are looking for.